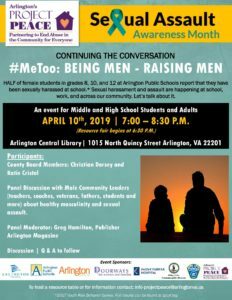 Half of Arlington Public Schools female students in grades 8, 10 and 12 report having been sexually harassed at school, and 20% report a dating partner made unwanted contact with them, according to the Arlington 2017 Youth Risk Behavior Survey. Additionally, requests for sexual assault services across Arlington County have seen increases year after year, from police to advocacy and hotline to medical services. Sexual harassment and assault are happening at school, work and in the community. To explore these issues and discuss how to support our young community members, Project PEACE — in partnership with the Arlington County Commonwealth Attorney’s Office, Arlington County Police Department, Arlington Magazine, Arlington Public Schools, Doorways for Women and Families and Inova Ewing Forensic Assessment and Consultation Team — is hosting a community discussion about masculinity and the role of men in addressing sexual assault and harassment in our community. 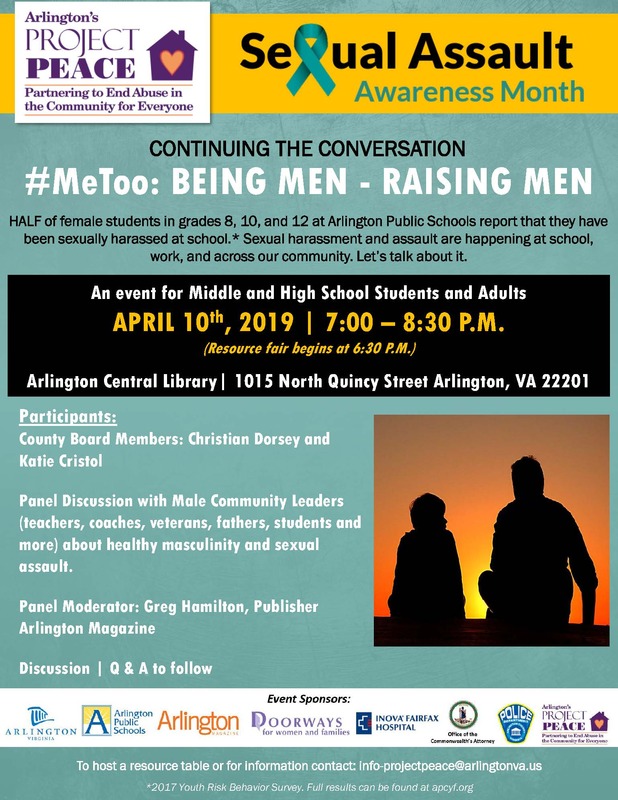 The event will take place on Wednesday, April 10, from 6:30 to 8:30 p.m. at Arlington Central Library Auditorium. Male role models in our community (coaches, fathers, teachers, students and faith leaders) lead the event as panelists and will be joined by local community leaders Christian Dorsey (Arlington County Board Chair), Lisa Tingle (Assistant Commonwealth’s Attorney), and Greg Hamilton (Publisher, Arlington Magazine) for a community conversation about masculinity, violence and the Arlington community. A resource fair will kick off the event with local non-profit organizations and social service providers on hand to connect attendees with information and resources. Arlington County Project PEACE is a coordinated community response dedicated to advancing the most effective and efficient array of education, prevention, protection, and support services to end domestic and sexual violence in the community. Learn more about Project PEACE. Arlington County firefighters will be going door to door offering home safety checks and giving relevant fire safety tips.